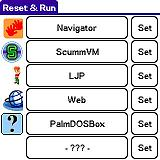 This application will allow you to soft reset your Palm and have an application executed right after the reset has finished (effectively taking the place of "Prefs" for one reset circle). I wrote this app for a friend of mine who is using TomTom on his TX and he needs to reset almost every time he wants to use it. Since doing that while driving can be a bit complicated, this app simplified things a bit. In addition, it makes the 'reset/wait-for-it-to-finish/go-to-launcher/select-application-to-run' process a bit more streamlined. 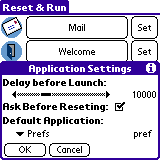 Don't forget to select the correct (system) program that normally gets executed after a reset in the application preferences. By default, it is Prefs, although as I recall Treos have a different one. Keep in mind that nothing bad should happen if you set a wrong application. One preference item you might want to tweak is "Delay before Launch". After a reset is finished, the system will poll applications to see if the need to do anything. In addition, some drivers might get loaded at that time, and the OS is polling for external cards. This value indicates how long the R&R should wait before actually launching the selected application. Setting it too high will just increase the delay before the selected app is launched, while setting it to low will not let other things to be load as needed. If the selected application exhibits any weird behaviour (like being unable to access VFS or if the UDMH setting seem to make no difference), then increase it a bit and try again.